September 10, 2012 Pilar B. A trainer once asked my classmates and me the following: “If you were on a deserted island and could only take two Montessori materials with you to support a child’s intellectual development, what would they be?” We pondered, debated, and finally concluded that for math it would have to be the Golden Beads that represent the decimal system and for language it would be the Moveable Alphabet. 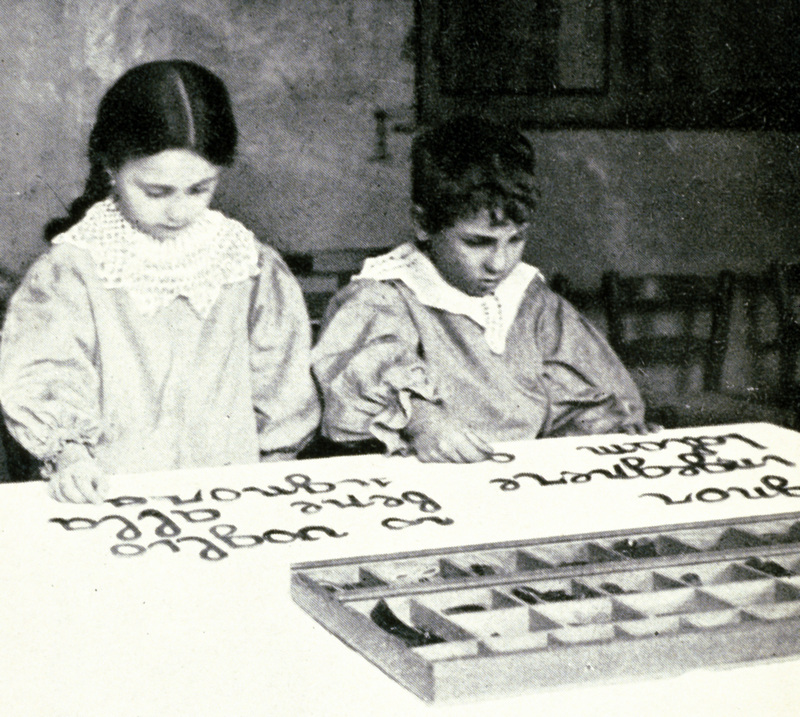 The Moveable Alphabet was developed by Dr. Montessori when she realized that children had the mental capacity to analyze the sounds in words way before they could synthesize them. The former is what we do when we write, while the latter is how we read. During a child’s first year in a Primary environment, we spend a lot of time playing Sound Games, which help children understand that words are composed of sounds. Around their third birthday, we start introducing the Sandpaper Letters – individual letters cut out of sandpaper and glued on wooden boards – which is how children learn what sound each letter makes and how the letter is written. In a genuine Montessori environment, we NEVER refer to a letter by its name, because we are preparing the child to write and read. Think about it: when you write or read the word “cat”, you are saying [c]-[a]-[t]… You are NOT reading “cee-ay-tee”!! So why teach the names of the letters? It’s a testament to children’s intelligence that they can learn to read in traditional environments where they have to be taught that “cee says [c]”. Why confuse the poor children? Eventually, after weeks and weeks (and sometimes months) of using the Moveable Alphabet, the child will start reading the words back spontaneously (and that’s when you leave the room, shed a tear of joy, send a quick thank you up to Dr. Montessori, and do a happy dance). And later on, perhaps when the child is five or six years old, he will become curious about correct spelling, and you can guide him in his new awareness. But only when he’s ready. Check out The Very Montessori blog, where you can see several examples of pre-schoolers writing with the Moveable Alphabet. View all posts by Pilar B.
I think it might be time to introduce the moveable alphabet to my son. His interest in spelling and reading is starting to grow. I am looking forward to seeing how he works with it. That’s awesome! Have you used it before? It used to be one of my least-favorite materials until I got the hang of how to present it and I developed more faith in the child’s abilities and timetable. It drove me nuts that they would take such a long time to figure it out! I’d love to hear about your experiences with it! No we haven’t used it before. I have read a bit about how to present it but still not entirely sure. What would you suggest? How many letters can he identify by sound? It should be a good 7-10 including at least two vowels but preferably three or four. Play a game with him to see if he can find the letters he knows in the box (you probably know which letters he knows): “Let’s find the [s]…” and let him find it and take it out. Do the same with the other sounds he knows and place all the letters he pulls out in a row. Then tell him: “Put back the [s]”, etc. until he’s put them all back in their proper spots. If he needs help you can guide him, but this is a good way to gauge if he’s indeed ready. If he’s pretty good about doing this, then you can say: “I’m going to think of a word.” Think of a 3-letter word that uses only the sounds that he knows, for example “pin”. Say the word slowly several times, each time making more emphasis on the individual sounds p-i-n. Then say: “I’m going to write it. Let’s see, what’s the first sound?” Repeat the word with the individual sounds and point out that [p] is the first sound. Take out a “p” and lay it on the rug. “Let’s see, what’s the next sound after [p]?” Repeat the word slowly a couple of times, exclaim that [i] is the next sound, and take it out and put it next to the “p”. Do the same thing for the last sound and STOP. Whatever you do, DO NOT read the word you just wrote. This is the hardest part, it almost always throws adults. 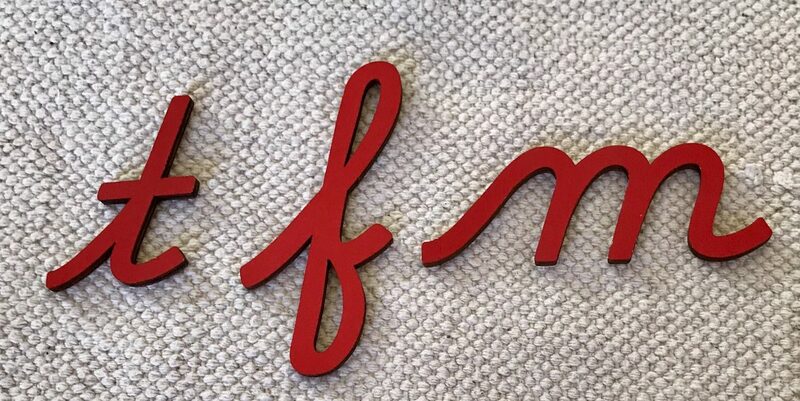 🙂 It helps to remember the purpose of the material: the moveable alphabet is a material for writing – NOT reading. Do two more words the same way, then put the letters back slowly and offer him a turn. He can start by writing the same words you wrote and then he can move on to choosing his own words. Some children need props, like a flag so they can write “flag” or hat so they can write “hat”, but it’s good to move away from this quickly or else they will be limited in their choices of words. Some children are really quick studies, others take a long time to catch on, and there’s NOTHING wrong with that – it just means they need to work more on sound games and sandpaper letters. The purpose of the mov alph is to help children express their thoughts, NOT to get them writing at age 4. It’s developmental, not pedagogical. Remember that and you will take the pressure off yourself and your boy. Have fun! If you want to spend a ton of money you can get the materials from Nienhuis, but honestly, montessorioutlet.com makes good-quality materials for a fraction of the price. I find cursive to be an important element in learning to write and read, because each letter is very different from any other, which prevents the typical b-d-p-q confusion. Cursive writing allows the wrist to move naturally and helps children develop better coordination and attention to detail than print. And no, children have absolutely no trouble switching from cursive to print later on. But they DO have problems learning cursive after print. Thank you, thank you! Yes, cost is certainly a factor, so I appreciate the links. Love this post! I have a smart little guy who loves letters and sounding out words. I’m excited to watch him grow his ability! thanks.